myLifeCollected is a suite of applications for DSiWare which we think will make your life more fun and enjoyable! Take a photo, write a note then facebook, email or mail it to a friend. 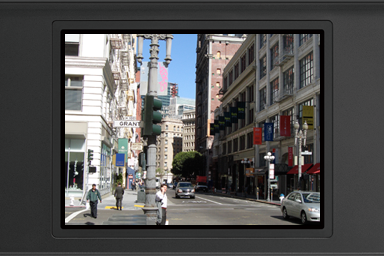 Use either camera on your Nintendo DSi to take a photo. 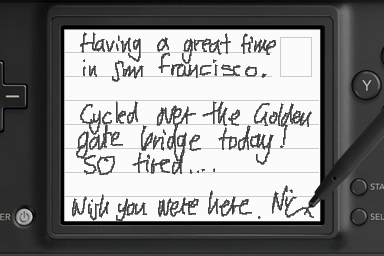 Use the touch-screen and stylus to write a note or draw a picture. Then click the done button to create the postcard. Postcards you have created can be edited later. Use the +Control Pad to change between over 50 background themes. 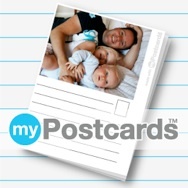 Or browse the photos you have already taken with either myPostcards or the DSi Camera application. Click on the facebook icon to upload your postcard to facebook. Decided you don’t like the photo you have chosen? Just click the camera icon and choose or take a new one. Transfer your postcard to SD card and you can then use your Mac or PC to email and print out the postcard. Join the myPostcards flickr group by clicking here!